One of the oldest fights among the GI Joe fandom is realistic military influence vs. wild, outlandish sci-fi elements. Of course, the fans who insist that GI Joe should be 100% real all the time conveniently forget that the original series of toys included a guy who used laser guns. So those weird elements? They have precedence. A casual visitor to Cobra Island might find his access to certain areas blocked by a maze-like system of shallow canals. These interconnecting waterways are abundantly stocked with ravenously hungry man-eating crocodiles which have been deliberately conditioned to be especially hostile and fast. The man responsible for these ultra-aggressive reptiles is Croc Master, a former alligator wrestler and burglar alarm salesman who founded Guard-Gators Inc. in an effort to commercialize the use of alligators for home security. The original Croc Master was introduced just when things started to get really strange. The class of 1987 also included Big Boa, Battle Force 2000 and Raptor, so you get an idea of how things were changing. Compared to the guy who wore a bird suit, Croc Master isn't so crazy, is he? Croc Master is an entirely new sculpt. The scaly details on his shirt and boots aren't exactly something you could fake, are they? Still, if the 1987 version could have a uniquely sculpted body, the fans would be crying bloody murder if this one didn't, as well. The boots lace up the sides, and seem to have rubber caps over the toes. There's along knife sculpted onto the right boot, and Croc Master's belt has a large eyeball over the buckle. The figure's head is a very nice update. Croc Master's look has always been simple, a black hood/mask with red eyes and a silver breathing mask, and this toy keeps that set. Of course, things really are better now. The rebreather used to look like it was actually embedded in his head, but now it (more appropriately) seems to be resting over his mouth and nose. The cloth mask is even detailed with stitches, as though it has been torn and repaired. Speaking of which, there's a little sculptural easter egg on Croc Master's right arm. 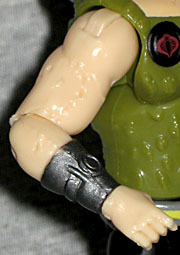 Take a close look at his bicep, and you'll notice what, at first, appears to be some molding errors. It's bumpy and uneven, like the parting line scraper didn't do their job right. However, upon closer examination, the truth becomes clear: those are bite marks! Obviously whoever sculpted Croc Master decided to show kids the consequences of spending all day around with large, toothy reptiles. Heck, even the famous Steve Irwin had his arm grabbed and broken by a croc one time, so there you go. 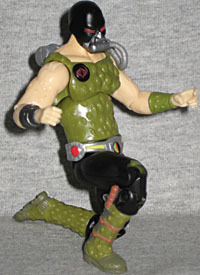 On the old toy, Croc Master had a thin black hose that ran from his breathing mask to a little bump on his shoulder. Yeah, not too logical. Now the hose is much bigger, and CM has an actual air tank as a backpack. It's small updates like that that make G3 figures so cool: the things that don't directly copy what came before, but are clever improvements. 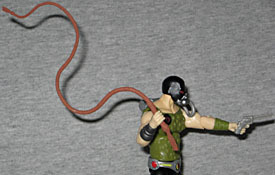 The figure's other accessories include an update of his whip, and what may be the best 1:18-scale revolver ever made. No, it doesn't open or anything, but it's immaculately detailed in a way not often seen in mainstream toys. It fits in the alligator-skin holster on his left leg, and he has his left index finger extended for the trigger. Who knew Croc Master was a southpaw? Since the general rule of thumb is "crocodiles have long thin noses, alligators have short thick noses," a lot of people think Croc Master comes with a gator rather than a croc. However, that may not be the case: estuarine (saltwater) crocodiles of Australia and Persian marsh crocodiles of India both resemble alligators, thanks to their short faces. So yes, this might still be a gator, but to say for sure that the figure doesn't come with a crocodile is wrong. The croc is 4" long and features an articulated jaw - a first for any Croc Master pet. 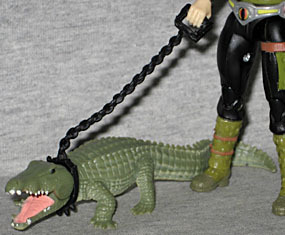 Just like in '87, the croc is controlled by a spiked collar. It's hard to believe this is only the second time Croc Master's gotten a toy (remember, the last one was this guy's replacement), but Hasbro really gave us something good here. The majority of the mold has been reused as the Rise of Cobra Terra-Viper, but it works a lot better the way it was intended to be.